We were so sad to hear about Charlie's passing, and send our deepest regrets to Linda and Ethel. Mar-Lin has always had a special place in our hearts. Our chance encounter with Linda at Rolling Hills brought back lots of great memories and the opportunity to reminisce with Charlie and Ethel over ice cream in Manalapan. We are so very grateful for all of the memories. was sad to learn of uncle charlies passing. learned fun and frolic and sports and culture at wonderful camp mar-lin. my heartfelt sorrow and love goes to all the Braude's. in peace. patty. Just as we all learn how foods "should" taste in our mothers' kitchens, I learned what summer shoud be at Camp Mar-Lin. I am awestruck when I think that there are thousands of people who learned that same definition of "summer". Uncle Charley enriched all of us and our world is better for his life and his memory. Our thoughts and prayers are with Aunt Ethel and Linda. We are all saddened by the death of our dear Uncle Charley.If you would like to, please leave a message on the bulletin board, and I will present copies to Ethel and Linda on Friday. Thanks. I'm sad to report... my mother, Marilyn Kravitz Slovitt, spoke with Aunt Ethel this afternoon... Uncle Charlie passed away this morning. He died of heart failure. The funeral service will be Friday, Dec. 24 at Weinstein's Mortuary in West Hartford, CT. I want to tell everyone that I saw him over Thanksgiving and he was just as sharp, loving and great as when I went to camp back in 1974-75. Regretfully I missed the reuinion, but from Charlie and Ethel's first hand accounts, I felt as if I had been there with you all. We will miss you Uncle Charlie and our thoughts are with you Aunt Ethel. Trivia person is devastated.Good-bye, Uncle Charley, and thanks for the memories. For a book that I am writing, I am trying to compile the names of people who met at Mar-Lin and then got married (to each other). Can anyone help me out here? the searcher has a hard-on for all women, not just those named Linda. WHERE IS JEANNIE LOUDON? WHERE IS HARRIET BURDEN? WHERE IS RONNIE GRUSKY? WHERE IS MADDIE LONG? Looks like the searcher has a real hard-on for girls named Linda. What is this, theme searching? How many times do you ask the same question? By the way, how many different types of lanyards were there? What did counsellors carry on their clipboards? Did anyone ever hit a ball to the Arts & Crafts shop on the fly? WHERE IS LINDA BURLAKOFF? WHERE IS LINDA RAUCH? WHERE IS LINDA TRAGER? WHERE IS LINDA BROWDY? Happy Thanksgiving! I will be cooking turkeys and the works for all of you. Be at the Mess Hall on Thursday at 4pm to celebrate Thanksgiving at Camp Mar-Lin. ...and fill up your plate the first time, because there will be NO SECONDS! WHERE IS BOB TURCHIN? WHERE IS JESSSICA GARRISON?WHERE IS RICK FEINSTEIN?WHERE IS SUSAN SEMEL? Hey, picture boy, you keep on putting these pictures on here without identifying who they are of. So who is the blonde babe in that last one? By the way, is there any interest for a little Mar-Lin reunion on the West Coast? If so, indicate in this space if you would want to come (someshere in the San Francisco area). More later. WHERE IS WOJEY? WHERE IS REBEL? WHERE IS LURCH? WHERE IS THE SQUEAKER? Yes, trivia person, that is the cabin behind the canteen, where Uncle Simmie slept in the early sixties, and then later, other head counselors. It seems to me, that by your mention of Bill Areskog, you have revealed your age, or I should say youth. When was Bill the head counselor, in 1989? Trivia person is constantly amazed by the scope of knowledge of our former campers. So now we are conversing in tongues. Extraordinary! At least we can be thankful that someone relocated the beloved front gate, even if we have to get onto this screen to see it. Insofar as that dinky little cabin is concerned, it looks like the one behind the canteen, by the trail going up to Overlook, where the head counselors slept and made merry. Also, Bill Areskog lived there for a while. Am I right? Vous, vous parlez des filles venues a votre cabine. Pourquoi toutes ces paroles en Espagnol quand la langue de l'amour, c'est Francais? Yo viviendo en esta cabina, con los otras en anos diferente. Claro, yo soy el mejor hombre de todos los campisanos. Pero, cuantas muchachas estan en la cama conmigo! 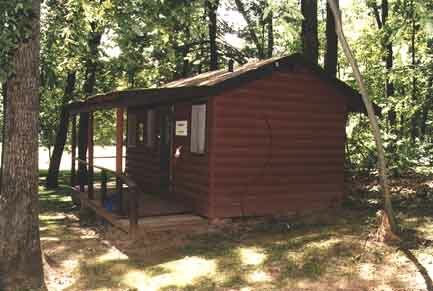 Name: Trivia Picture: Who lived in this cabin?????? WHERE IS MARGIE SACK? WHERE IS MICHAEL PARRISH? WHERE IS NICKI BERMAN? WHERE IS STEVE JACOBS? Nice pictures, Jeff. 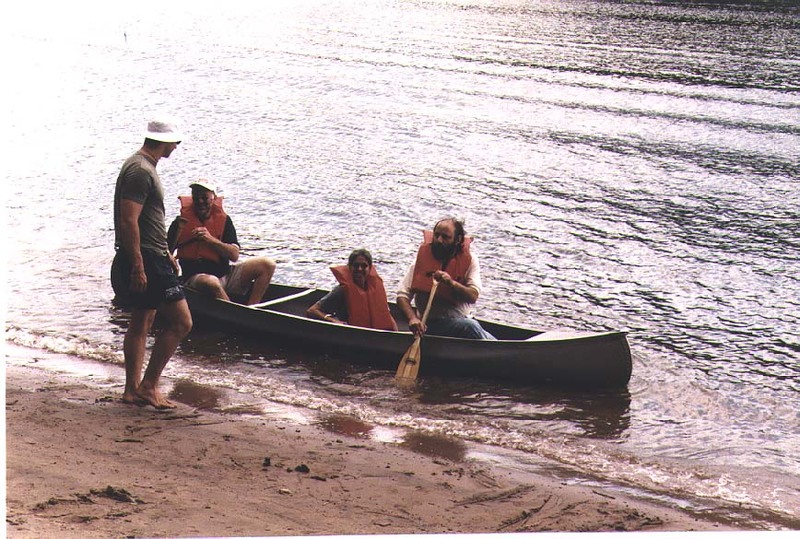 Who are the people in the canoe? 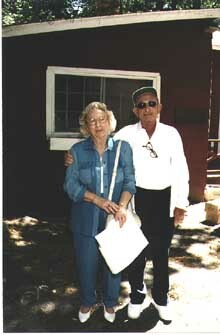 Who is the old guy with Ethel? Still waiting for more entrants in the contests. Do I have to make the prizes more enticing? And what's this stuff about losing your innocence at the boathouse? That's just a myth like the one-armed brakeman and the legend of Johnny Pus-sucker. None of that is real. Or is it? Did people really do it in the boathouse? Who would truly know? For famous foods, how about Bonnie Blintz? We found it! You can reclaim it at the Lost & Found. This message is to the person who lost their innocenceat the boathouse. The only foods I remember were like a picnic, a lot of Burgers and Weiners. Be sure to visit the Bulletin Board Archives...a good way to pass a rainy day when there's no Bingo game going on in the Mess Hall.